Lambs sponsor 'Spirit of Youth' award! 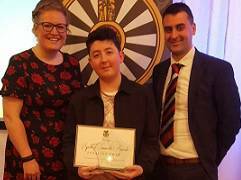 Congratulations to Thomas Bassett, who won the TFC sponsored 'Spirit of Youth' award as the recent Spirit of Tamworth event on February 2nd at Drayton Manor. Organised by Tamworth Round Table, the event aims to recognise members of the Tamworth community that have made a difference to the lives of others.